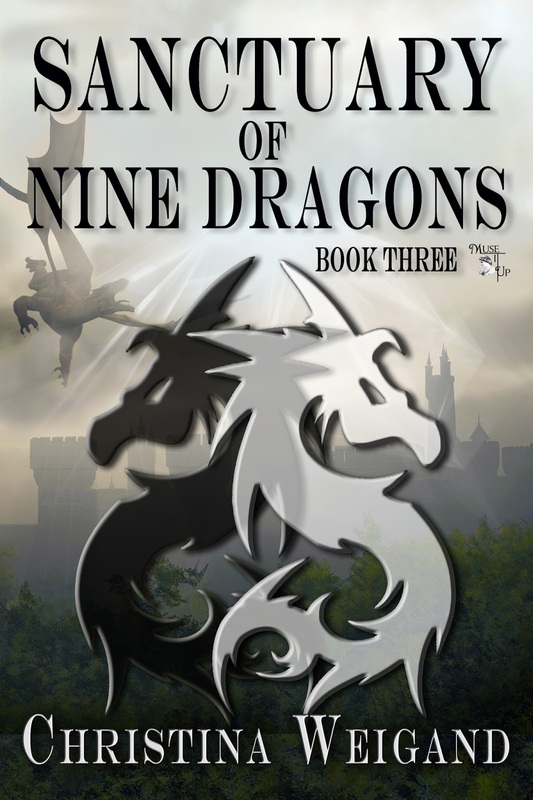 Christina Weigand stopped by my blog today to share and celebrate the one year anniversary of the publication her book Sanctuary of Nine Dragons: Book Three. This book is the third one in her series Palace of the Twelve Pillars. Joachim cringed as he thought about what he had to do. The council had decided. He didn’t agree completely, but in the end, Joachim knew it was the only way; something had to be done. Maybe Brandan would give him a reason not to send him away. King Brandan stomped into the room. “Why, Brother, have you no throne prepared for your poor, missing brother? I’m hurt. I expected more from you and my sister-in-law. Maeve, dear, couldn’t you have helped him prepare better?” He stepped toward her, quickly grabbed her hand, and kissed it. Brandan laughed, pushed him aside, and stepped up to claim his throne. Joachim grabbed his twin's shoulder, spun him around, and punched him in the mouth. Rubbing where Joa’s fist had landed, Brandan smirked. “Well, my brother has finally developed some stones.” He raised his other hand to hit Joachim. Matthias stepped forward, sword in hand and grabbed his arm before he could hit Crato's king. He pulled the king’s brother away, so Joachim could reclaim his throne. “Why dearest brother, whatever do you mean?” Brandan asked. “Ever since we were boys, you have done everything you could to make trouble. I was always willing to forgive you and hoped you would change your evil ways. But no more! You have pushed me—pushed this country—too far this time,” Joa thundered at him. “What are you rambling on about?” Brandan sneered and bit a fingernail. Maeve rose from her throne. Joa put his hand on her arm to stop her. Ignoring Brandan’s comments, the king continued. “First, I strip you of your title. You are no longer King Brandan but will henceforth be known simply as Prince Brandan.” He paused and swallowed. He didn’t know if he could continue. The lump in his throat felt as big as a koali fruit. He swallowed again. Maeve grasped his hand. Warmth and reassurance enveloped him. He knew what he had to do. “You’re a misguided fool.” Brandan sneered. “If you believe that by exiling me, you are saving yourself from evil—think again. You may have peace and rest comfortably for a short while, but don’t assume I won’t find a way to come back and destroy you.” He stepped up to the thrones and leaned forward, placing a hand on each. The guards on either side of the king stepped forward to stop him. Joachim raised his hand signaling them to stop. Brandan glared at the guard and muttered, “Freisen!” The man froze where he stood. While he was speaking, Rupert chanted a binding spell. Matthias came forward and placed his sword tip to Brandan’s back. As the prince was escorted from the room, Joa slumped back into his throne. It was done, he thought as remorse washed over him. A tear crawled down his cheek as Maeve squeezed his hand. I had a chance to talk with Joachim and Brandan: Sanctuary of Nine Dragons. C.W. : Many exciting things happened in Palace of the Three Crosses: Book Two. Both of you were crowned king and got married. Joachim you became a father. And Brandan you managed to rid Ramajadin of your enemy Waldrom. What could possibly be left to be done Sanctuary of Nine Dragons? Brandan: Until I can defeat my brother and his god there is plenty for me to do. If I can’t have his wife and his throne, I will find a way to eradicate him and the Kningrad. C.W. : But don’t you already have a throne and a Mantion wife? Brandan: That Mantion witch disappeared after she tried to kill me and as far as I am concerned she can stay hidden. I want nothing to do with her and if she dares show her face I will eradicate her along with everyone else that gets in my way. Joachim: Brandan, your attitude is unnecessary. I am more than willing to share the rule of Ramajadin with you. Maeve and I care about you and only want you to be a part of our family and rule our countries in peace. I will even overlook you past indiscretions and forays into Sidramah’s magic. Brandan: What makes you think I want to share rule? No I should have it all. C.W. : Gentlemen, let’s change the subject. Joachim you recently became a father. How does that change the way you do things? Brandan: I can answer that. He’s become even more of a pidgekin than he was before. He’s always fawning over those brats and whining about his arm. I think he should step down from being king and husband and let me take over. Joachim: Brandan stop exaggerating. I definitely have a different perspective, but if anything it is a better one. If you would only stop your extracurricular activities and help more you would see it too. Brandan: Bah. See things through your eyes. Not going to happen. C.W. : Do you two ever agree on anything? Brandan: We would if he would come to see things my way. C.W. : So what do we have to look forward to in Sanctuary? Joachim: The Mantion continue to attack. It seems even Waldrom’s death has not put an end to the hostilities. With Waldrom gone and no obvious leader they seem determined to prevent any peace and happiness from occurring. Brandan: Brother, you know so little. I’m sure there is someone pulling the strings and when you figure out whom, it will be too late. C.W. : It seems as if our time is up. Thank you for your time. They returned from the brink of Hell, but everyone questions if they are truly healed and one with Asha. 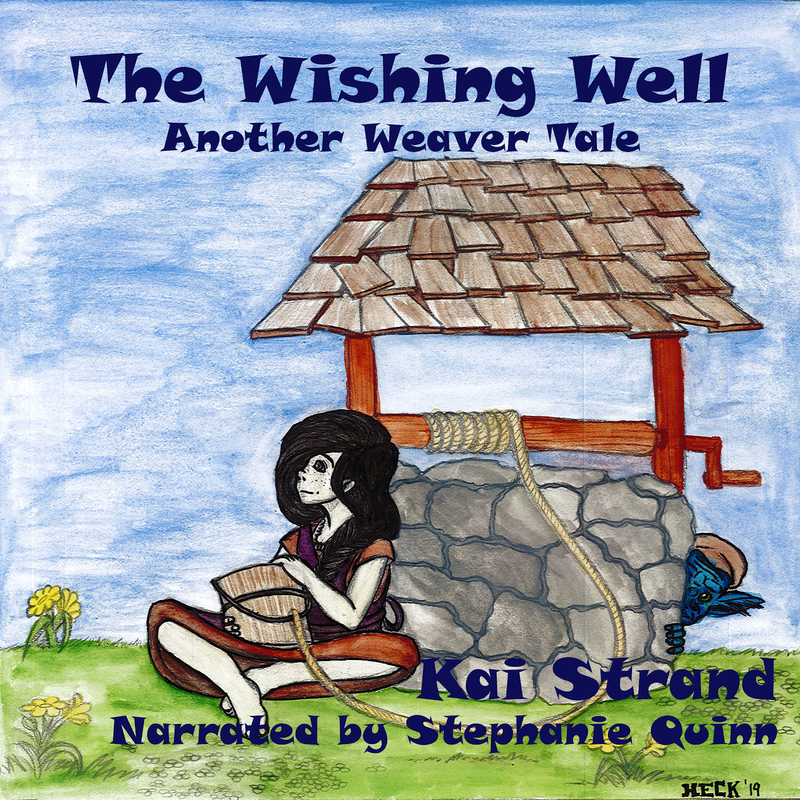 Christina Weigand’s a writer, wife, and mother of three grown children and a teenage daughter. She is also Nana to three granddaughters. She lives with her husband and youngest daughter in Pennsylvania. Currently, she’s working on fantasy novels and inspirational writing. Through her writing, she strives to share the Word of God and help people to realize the love and mercy He has for everyone. When she’s not writing, she’s lectors at her Church and volunteers to help young people develop a love for reading and writing. Jesus fills her home with love as she shares Him through her writing. Thank you for letting me visit. Glad to have you back again, Chris. Time sure goes by fast. It seems like just a short time ago the books came out. Congratulations to you Chris. Great interview. Congrats to Christina. I'm pleased to meet her and learn about her work.